Because susceptibility to celiac disease is associated strongly with HLA-DQ2 (DQA1*05/DQB1*02) and weakly with HLA-DQ8 (DQA1*03/DQB1*03), a subset of patients carries both HLA-DQ2 and HLA-DQ8. As a result, these patients may express two types of mixed HLA-DQ2/8 transdimers (encoded by DQA1*05/DQB1*03 and DQA1*03/DQB1*02) in addition to HLA-DQ2 and HLA-DQ8. Using T cells from a celiac disease patient expressing HLA-DQ8trans (encoded by DQA*0501/DQB*0302), but neither HLA-DQ2 nor HLA-DQ8, we demonstrate that this transdimer is expressed on the cell surface and can present multiple gluten peptides to T cell clones isolated from the duodenum of this patient. Furthermore, T cell clones derived from this patient and HLA-DQ2/8 heterozygous celiac disease patients respond to gluten peptides presented by HLA-DQ8trans, as well as HLA-DQ8, in a similar fashion. Finally, one gluten peptide is recognized better when presented by HLA-DQ8trans, which correlates with preferential binding of this peptide to HLA-DQ8trans. These results implicate HLA-DQ8trans in celiac disease pathogenesis and demonstrate extensive T cell cross-reactivity between HLA-DQ8 and HLA-DQ8trans. Because type 1 diabetes is strongly associated with the presence of HLA-DQ8trans, our findings may bear relevance to this disease as well. Celiac disease (CD) is a chronic inflammatory disease of the small intestine triggered by gluten proteins derived from wheat, barley, and rye (1, 2). Ingestion of gluten by sensitive individuals causes intestinal villous atrophy, resulting in malabsorption, diarrhea, and, if left untreated, growth retardation in children. However, in most cases, these symptoms disappear upon removal of gluten from the diet. Genetic susceptibility to CD is determined mainly by the HLA-DQ locus, containing the closely linked HLA-DQA1 and HLA-DQB1 genes. More than 90% of CD patients carry HLA-DQA1*05 and HLA-DQB1*02, whereas the remainder usually carry HLA-DQA1*0301 and HLA-DQB1*0302 (HLA-DQ8) (1–4). In line with this, gluten-specific CD4+ T cells isolated from intestinal biopsies of CD patients respond to gluten peptides presented via HLA-DQ2 or HLA-DQ8 (5–11). Such T cell stimulatory gluten peptides are often recognized considerably better upon deamidation by tissue transglutaminase (TG2), released by damaged cells and/or activation of extracellular TG2, because deamidation selectively improves binding of gluten peptides to HLA-DQ2 and HLA-DQ8 through the introduction of negative charges in the gluten peptides (12, 13). The available crystal structures of HLA-DQ2–gliadin and HLA-DQ8–gliadin complexes have underscored the importance of these negative charges in the binding of the gluten peptides to HLA-DQ2 and HLA-DQ8 (14, 15). Therefore, deamidation of gluten peptides is believed to be essential for the development of full-blown CD. Type 1 diabetes mellitus (T1D) is another disease genetically associated with HLA-DQ, albeit in a different fashion: it is associated mainly with HLA-DQ8 and, to a lesser extent, with HLA-DQ2 (16, 17). HLA-DQ2/HLA-DQ8 heterozygosity confers a synergistically increased risk for T1D. Epidemiological studies (16, 17) link this to the combined presence of HLA-DQA1*05 (HLA-DQ2α) and HLA-DQB1*0302 (HLA-DQ8β) that together encode an unconventional HLA-DQ transdimer, hereafter termed HLA-DQ8trans. It has already been established that such transdimers can indeed be formed (18, 19). Although a plausible explanation for this association would therefore be the preferential presentation of autoantigen-derived peptides by HLA-DQ8trans, the peptide-binding characteristics of HLA-DQ8trans have not been determined, and no peptides that are presented preferentially by HLA-DQ8trans have been reported. In the current study, we took advantage of gluten-specific T cells that were isolated from a small intestinal biopsy of a patient with CD who expresses HLA-DQ8trans but neither HLA-DQ2 nor HLA-DQ8 to explore the role of HLA-DQ8trans in CD. A pepsin-trypsin digest of gliadin (Sigma Chemical, St Louis, MO) was prepared, as described (10). TG2 treatment was performed by incubating the pepsin-trypsin gliadin digest with TG2 (Sigma) in 50 mM triethylalamine-acetate (pH 6.5), 2 mM CaCl2 at 37°C for 4 h, as described (13). Peptides were synthesized by standard Fmoc chemistry on a multiple peptide synthesizer (Syroll; MultiSyntech, Witten, Germany). The integrity of the peptides was verified by reverse-phase HPLC and mass spectrometry. Polyclonal gluten-specific T cell lines were isolated from the small intestine of CD patients, as described (10, 13). In short, biopsies were cultured with a mixture of gluten and TG2-treated gluten for 5 d. Subsequently, IL-2 (20 Cetus units/ml; Novartis, Arnhem, The Netherlands) and IL-15 (10 ng/ml; R&D systems, Abingdon, U.K.) were added to expand the T cells. Restimulation was performed with mixed irradiated allogeneic PBMC in the presence of PHA (1 μg/ml; Remel, Lenexa, KS), IL-2 (20 Cetus units/ml), and IL-15 (10 ng/ml). The resulting T cell lines were stored in liquid nitrogen and later tested for reactivity against a pepsin-trypsin gliadin digest and a TG2-treated pepsin-trypsin gliadin digest in a T cell-proliferation assay. Gluten-reactive lines were cloned by limiting dilution and again expanded by restimulation at 1–3-wk intervals. Clones were stored frozen in liquid nitrogen. In addition, we used several T cell clones isolated from a healthy HLA-DQ8 homozygous individual. These clones respond specifically to peptide DILEDERAAVDTY (termed DERAA, minimal core indicated in bold) in the context of HLA-DQ8 and were described previously (20). The study was approved by the Medical Ethics Committees of the Free University Medical Center and the Leiden University Medical Center. Written informed consent was obtained from each subject before enrollment. The following EBV-transformed lymphoblastoid B cell lines (EBV-LCL) were used: BSM (DQA1*0301; DQB1*0302), CST (DQA1*01/*03; DQB1*0602/*0302), DEM (DQA1*01/*03; DQB1*0501/*0302), FK (DQA1*0501/*0301; DQB1*0201/*0302), Ducaff (DQA1*0501; DQB1*0201), BM9 (DQA1*0401; DQB1*0402), 721.82 (DQ-negative) (21), and autologous EBV-LCL of patient T (DQA1*0505/*0401; DQB1*0302/*0402). These cells, as well as 293 and 293T cells, were maintained in IMDM (Lonza, Verviers, Belgium) supplemented with 10% heat-inactivated FCS (PAA Laboratories, Pasching, Austria). Third-generation lentiviruses were produced following the standard procedure (22). Briefly, lentiviral vectors containing the genes of interest (pRRL-CMV-DQA1-GFP or pRRL-CMV-DQB1-puro) were cotransfected with “helper” plasmids encoding HIV-1 gag-pol, HIV-1 rev, and HIV-1 VSV-G env into 293T cells. Virus-containing supernatants were harvested after 48 and 72 h, passed through a 0.45-mm filter, and stored until use at −80°C. For transductions of 293 cells, viral supernatants were added to fresh media supplemented with 8 μg/ml Polybrene (Sigma), and cells were incubated overnight. Viral supernatants were removed, and cells were washed twice and cultured in normal medium, as described above. Finally, transduced cells were single-cell sorted using FACS analysis to obtain clones with high DQ expression. The resulting cells expressed HLA-DQ8 (DQA1*0301/DQB1*0302), HLA-DQ8trans (DQA1*0501/DQB1*0302), HLA-DQ2 (DQA1*0501/DQB1*0201), or HLA-DQ2trans (DQA1*0301/DQB1*0201) in the absence of other HLA class II molecules. Proliferation assays were performed in triplicate in 150 μl IMDM supplemented with glutamine (Life Technologies/Invitrogen, Grand Island, NY) and 10% human serum in 96-well flat-bottom plates. Briefly, APC were loaded with Ag for 2 h, after which 15,000 T cells were added. We used 30,000 mitomycin C-treated (Sigma) EBV-LCL cells or 40,000 mitomycin C-treated 293 transductants as APC. Unless otherwise indicated, TG2-treated gliadin was used at a final concentration of 450 μg/ml, and synthetic peptides were used at a final concentration of 6 μg/ml. 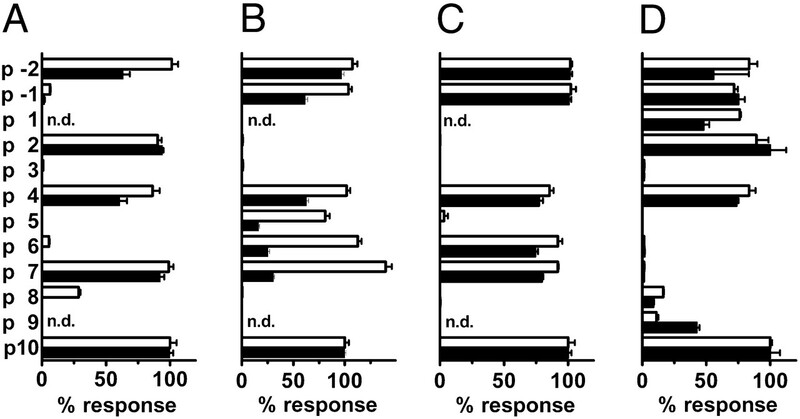 The latter peptide concentration was based on the observation that all T cell clones used in the study displayed maximal responses to this concentration of peptide when tested in dose-response experiments. After 48 h at 37°C, cultures were pulsed with 0.5 μCi [3H]thymidine and harvested 18 h later. Peptide-binding assays were performed, as described previously (23, 24). In short, cell lysates from 293 transductants expressing either HLA-DQ8 or HLA-DQ8trans were incubated on SPV-L3 (anti–HLA-DQ)–coated 96-well plates. Titration ranges of the tested peptides were mixed with a fixed concentration of biotinylated indicator peptide and added to the wells containing SPV-L3 and cell lysates. The sequence of the HSV-2–derived HLA-DQ8 indicator peptide was EEVDMTPADALDDFD; the sequence of the HLA-DQ8trans indicator peptide was AAPHTTQPAVEAA. The PHTTQPAVE peptide was identified as one that was naturally bound to the HLA-DQ8trans dimers present on the 293 transductants expressing HLA-DQ8trans (M. van Lummel, B.O. Roep, J.W. Drijfhout, P.A. van Veelen, and F. Koning, unpublished observations) and extended with two alanines at the N- and C-termini for use in the binding assay. Bound indicator peptide was detected using europium-streptavidin (Perkin Elmer, Boston, MA) and measured in a time-resolved fluorometer. Molecular simulations of HLA-DQ8 and HLA-DQ8trans molecules complexed with various peptides were carried out as previously described, using the Discover Suite of Accelrys (San Diego, CA) on a Silicon Graphics Fuel instrument (25). For complexes with the HLA-DQ8 allele, the crystal structure of the HLA-DQ8–insulin B11-23 peptide (26) was used as the base molecule. The peptide register was unambiguously decided in all cases from the motif of the allele (27, 28). The modeled structure of the HLA-DQ8trans molecule and its bound peptide was achieved by superposition of the β-pleated sheet regions in the α1β1 domains of HLA-DQ2 and HLA-DQ8 (14, 26). All peptides used in the study could only be fit in a single unique register in the groove of the HLA-DQ molecules. Brookhaven Protein Data Bank coordinates of modeled molecules reported in this study will be provided to interested researchers upon request. A small intestinal biopsy was obtained from a 42-y-old female CD patient who carried the unusual HLA-type HLA-DQA1*0501/*0401 and HLA-DQB1*0302/*0402 (Table I). This genotype encodes neither HLA-DQ2 nor HLA-DQ8, but it could lead to the expression of an HLA-DQ–transdimer encoded by the HLA-DQ2 α-chain (HLA-DQA1*0501) and the HLA-DQ8 β-chain (HLA-DQB1*0302), termed HLA-DQ8trans. In addition, this genotype encodes HLA-DQ4 (HLA-DQA1*0401/HLA-DQB1*0402), which is not associated with CD. We isolated several T cell clones from the duodenal biopsy (Table I) that proliferated specifically in response to a TG2-treated pepsin-trypsin digest of gliadin presented by autologous EBV-LCL. Next, we tested the T cell clones with a panel of previously identified T cell stimulatory gluten peptides that included all known HLA-DQ2– and HLA-DQ8–restricted peptides. One clone (T15) responded to stimulation with the γ-gliadin–derived peptide QQPQQSFPEQERP (Fig. 1A, DQ2–glia-γ1, minimal core indicated in bold; Supplemental Table I), an epitope known for its recognition via HLA-DQ2 (8), whereas two other clones (T316 and T313) recognized the α-gliadin–derived peptide SGEGSFQPSQENP (Fig. 1B, DQ8–glia-α1, minimal core indicated in bold), a known HLA-DQ8 epitope (13). Finally, another clone responded to the pepsin-trypsin digest of gliadin but not to the gluten peptides tested and, therefore, is specific for another (unidentified) gliadin sequence (Fig. 1C). Recognition of multiple gluten epitopes by duodenal CD4+ T cell clones from celiac patient T carrying HLA-DQ8trans. The proliferation of three gluten-specific clones was measured: T15 (A, D), T316 (B, E), and T315 (C, F). A–C, The clones were stimulated with autologous EBV-LCL, either unloaded (−) or loaded with TG2-treated gliadin (gliadin-TG2), peptide QQPQQSFPEQERP (DQ2–glia-γ1), or peptide SGEGSFQPSQENP (DQ8–glia-α1). Clones T15, T316, and T315 were stimulated with DQ2–glia-γ1 (D), DQ8–glia-α1 (E), or gliadin-TG2 (F), respectively, in the absence (−) or presence of EBV-LCL from patient T (DQ8trans/DQ4) or from an HLA-DQ4–homozygous control donor (DQ4/DQ4). The results of one experiment are shown, representative of at least three experiments with similar results. Data are means ± SEM of measurements performed in triplicate. 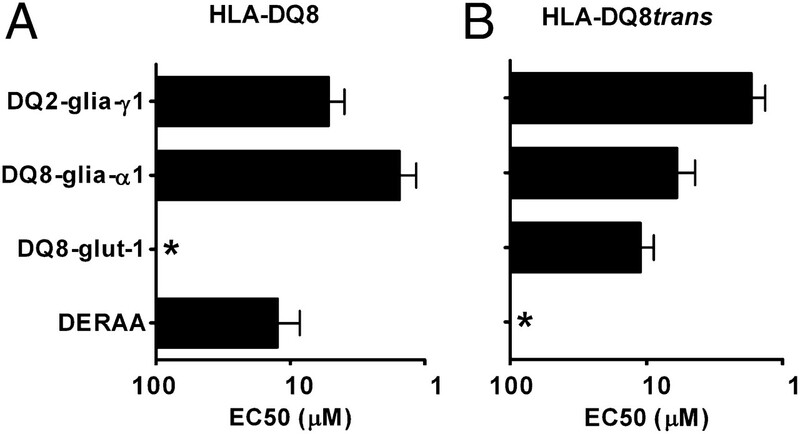 The recognition of these gluten peptides was likely restricted via HLA-DQ8trans, because the same Ags were not recognized when presented by EBV-LCL carrying HLA-DQ4 (Fig. 1D–F), the other HLA-DQ molecule present in this patient. To formally demonstrate that HLA-DQ8trans can present gluten peptides, artificial APC were generated that stably express HLA-DQ2, HLA-DQ8, or HLA-DQ8trans as a result of the lentiviral introduction of HLA-DQ2α (HLA-DQA1*0501), HLA-DQ2β (HLA-DQB1*0201), HLA-DQ8α (HLA-DQA1*0301), and/or HLA-DQ8β (HLA-DQB1*0302) into 293 cells. The T15 and T316 T cell clones indeed responded to the γ- or α-gliadin peptide (Fig. 2), respectively, when presented by 293 cells expressing HLA-DQ8trans but not by 293 cells expressing HLA-DQ2. The T cell clones also recognized these peptides on 293 cells expressing HLA-DQ8, which was unexpected because HLA-DQ8 was not contained within the patient’s genotype (Fig. 2). In summary, HLA-DQ8trans served as a restriction element for CD4 T cell responses against multiple gliadin epitopes in a CD patient carrying HLA-DQ8trans in the absence of HLA-DQ2 and HLA-DQ8. 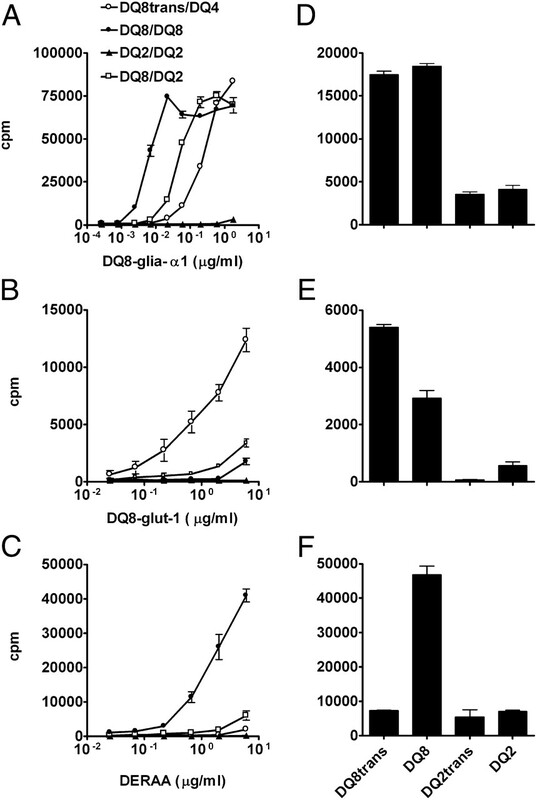 HLA-DQ8trans–restricted recognition of gluten peptides by two CD4+ T cell clones from celiac patient T. Proliferation of clones T15 (A, C) and T316 (B, D) in response to EBV-LCL (A, B) or HLA-DQ–transduced 293 cells (C, D) loaded with their peptide epitopes (DQ2–glia-γ1 for T15 and DQ8–glia-α1 for T316) was measured. EBV-LCL (A, B) was derived from patient T (DQ8trans/DQ4) or from HLA-DQ8 (DQ8/DQ8)- or HLA-DQ2 (DQ2/DQ2)–homozygous controls. The 293 cells (C, D) had been transduced with HLA-DQA and HLA-DQB genes encoding HLA-DQ8trans (DQ8trans), HLA-DQ8 (DQ8), HLA-DQ2trans (DQ2trans), or HLA-DQ2 (DQ2). The results of one experiment are shown, representative of at least three experiments with similar results. Data are means ± SEM of measurements performed in triplicate. We noticed that the T cell clones from the patient expressing HLA-DQ8trans recognized their cognate peptide ligands on artificial APC expressing HLA-DQ8trans, as well as on APC expressing HLA-DQ8 (Fig. 2). To assess whether this interchangeability of HLA-DQ8 and HLA-DQ8trans extended to other patients, we tested gluten-specific T cell clones derived from duodenal biopsies of HLA-DQ2/HLA-DQ8 heterozygous CD patients (Table I). These patients potentially express HLA-DQ2trans and HLA-DQ8trans in addition to HLA-DQ2 and HLA-DQ8. We tested six clones from two HLA-DQ2/8 CD patients (S and L). Results are shown for clones S13 and L3-12, specific for the α-gliadin peptide SGEGSFQPSQENP (DQ8–glia-α1, minimal core indicated in bold), and clone S12, specific for the high molecular weight (HMW)-glutenin peptide GQQGYYPTSPQQS (DQ8–glut-1, minimal core indicated in bold type) (29). The other three T cell clones were α-gliadin peptide specific and displayed responses similar to clones S13 and L3-12 (data not shown). Because gluten-specific T cell clones from rare HLA-DQ8 homozygous CD patients were lacking, we tested several T cell clones isolated from a healthy HLA-DQ8 homozygous individual. These clones respond specifically to peptide DERAA in the context of HLA-DQ8 (20). HLA-DQ8–homozygous EBV-LCL, which expresses HLA-DQ8 only, and the EBV-LCL from the patient that expresses DQ8trans and HLA-DQ4 served as APC. In addition, lentivirally transduced 293 cells served as artificial APC expressing a single type of HLA-DQ molecule: HLA-DQ2, HLA-DQ2trans, HLA-DQ8, or HLA-DQ8trans. Similar to clone T316 from the patient expressing HLA-DQ8trans and HLA-DQ4 (Fig. 1), clone S12 was stimulated strongly by the HMW-glutenin peptide presented by HLA-DQ8trans but weakly when it was presented by HLA-DQ8 (Fig. 3A, 3D). Both clones specific for the α-gliadin peptide (S13 and L3-12) responded to the peptide bound to either HLA-DQ8 or HLA-DQ8trans (Fig. 3B, 3E). Recognition of the α-gliadin peptide by clone S13 was considerably more efficient when the peptide was presented by HLA-DQ8 compared with HLA-DQ8trans (Fig. 3B). This preference for HLA-DQ8 was also present, but less pronounced, in the case of clone L3-12 (data not shown). Finally, the DERAA-specific T cell clones derived from a healthy HLA-DQ8 homozygous donor proliferated almost exclusively to the peptide in the context of HLA-DQ8 (Fig. 3C, 3F). In short, all tested T cell clones from CD patients carrying DQ8trans recognized their cognate peptide in the context of HLA-DQ8, as well as HLA-DQ8trans, and the majority of clones displayed a mild or pronounced preference for either HLA-DQ8 or HLA-DQ8trans. T cell clones from HLA-DQ8/DQ2–heterozygous CD patients recognize gluten peptides in HLA-DQ8 as well as HLA-DQ8trans. T cell proliferation was measured in response to EBV-LCL (A–C) or HLA-DQ–transduced 293 cells (D–F) expressing the indicated HLA-DQ alleles. A and D, Proliferation of celiac clone S13 in response to peptide DQ8–glia-α1. Comparable results were obtained with clone L3-12. B and E, Proliferation of celiac clone S12 in response to DQ8-glut-1. C and F, Proliferation of Cl-13, derived from a HLA-DQ8–homozygous healthy control donor, to peptide DERAA. Similar results were obtained with five additional DERAA-specific clones from the same donor. The results of one experiment are shown, representative of at least three experiments with similar results. Data are means ± SEM of measurements performed in triplicate. Differences in peptide-HLA–binding affinity might underlie differences in T cell recognition between peptides presented via HLA-DQ8 and HLA-DQ8trans. To test this idea, the three gluten peptides (α-gliadin, HMW-glutenin, and γ-gliadin) and the DERAA peptide were tested for binding to HLA-DQ in a cell free-binding assay using 293–HLA-DQ8 and 293–HLA-DQ8trans as sources of HLA-DQ (Fig. 4). The α-gliadin (SGEGSFQPSQENP) and γ-gliadin (QQPQQSFPEQERP) peptides both bound to HLA-DQ8 and HLA-DQ8trans, providing a rationale for the observed cross-reactivity of T cell clones between these HLA-DQ molecules. In contrast, the HMW-glutenin peptide (GQQGYYPTSPQQS), recognized preferentially via HLA-DQ8trans, bound to HLA-DQ8trans but not detectably to HLA-DQ8, whereas the reverse was true for the DERAA peptide. Thus, the peptide-binding data correlated well with T cell reactivity to peptides presented via HLA-DQ8 and HLA-DQ8trans (Figs. 3A, 3C, 4). In vitro binding of gluten peptides to HLA-DQ8 and HLA-DQ8trans. 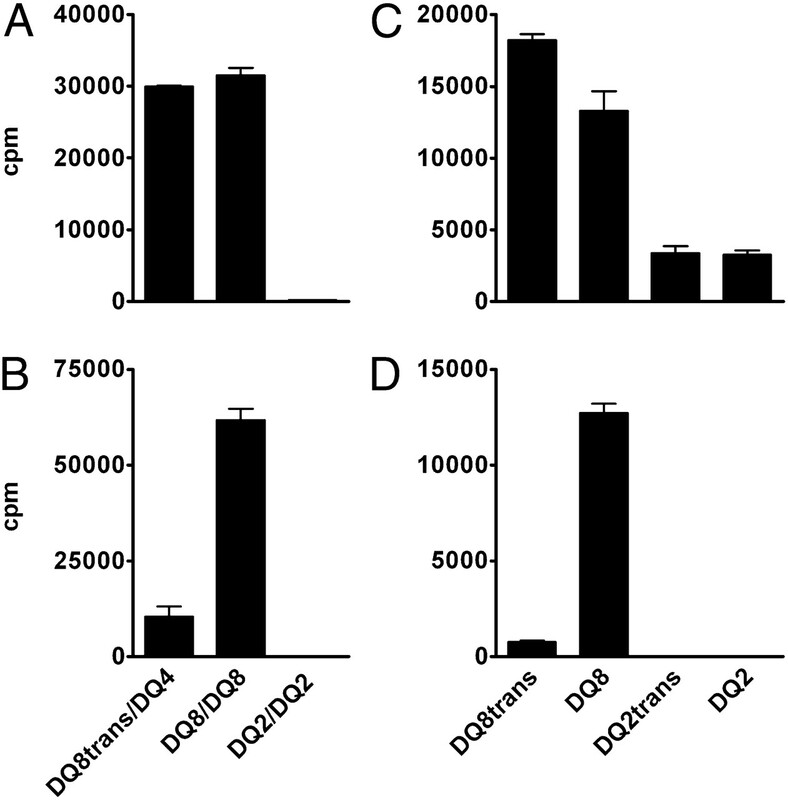 Binding of DQ2–glia-γ1 (QQPQQSFPEQERP), DQ8–glia-α1 (SGEGSFQPSQENP), DQ8–glut-1 (GQQGYYPTSPQQS), and DERAA (KDILEDERAAVDTY) was measured in a cell-free competitive peptide-binding assay, using 293-DQ8 (A) and 293-DQ8trans (B) as sources of HLA-DQ protein. A titration range of test peptide (0–300 μM) was incubated in the presence of a fixed concentration of biotinylated indicator peptide (0.6 μM). EC50 values are averages of two separate experiments with SEM, each performed in duplicate, plotted on an inverted scale, so that larger bars correspond to better binding. The asterisk denotes no detectable binding (EC50 > 100 μM). The T cell reactivity to the α-gliadin and γ-gliadin peptides bound to both HLA-DQ8 and HLA-DQ8trans implied that these peptides bind HLA-DQ8 and HLA-DQ8trans in a similar fashion, yielding MHC–peptide complexes with similar TCR contact residues. To substantiate this notion, we tested the impact of systematic alanine substitutions in both peptides on T cell recognition via HLA-DQ8 and HLA-DQ8trans, using T cell clones from three CD patients (Fig. 5). Effect of alanine substitutions in the antigenic peptides on T cell recognition in HLA-DQ8 and HLA-DQ8trans. Variants of DQ8–glia-α1 (SGEGSFQPSQEN [p−2 in bold], A–C) and DQ2-glia-γ1 (QQPQQSFPEQERP [p−2 in bold], D), carrying an alanine instead of the original amino acid at the indicated positions, were tested for recognition by clones T316 (A), S13 (B), L3-12 (C), and T15 (D) in the presence of DQ8-homozygous EBV-LCL (open bars) or patient T’s HLA-DQ8trans+ EBV-LCL (closed bars). Data are normalized for the proliferation (measured in cpm) of the clones in response to the peptide variant carrying an A at position p10, set at 100%. The results of a single experiment are shown, representative of at least two experiments. Data are means ± SEM of measurements performed in triplicate. n.d., not determined. Overall, the impact of alanine substitutions on T cell recognition of the α-gliadin peptide was very similar for HLA-DQ8 and HLA-DQ8trans (Fig. 5). For clone T316, alanine substitutions at positions p−1, p3, p5, p6, and p8 nearly completely abrogated recognition via HLA-DQ8 and HLA-DQ8trans, whereas substitutions at p−2 and p4 selectively reduced the recognition via HLA-DQ8trans (Fig. 5A). Similarly, substitutions at p2, p3, and p8 abrogated recognition via HLA-DQ8 and HLA-DQ8trans by clone S13, whereas substitutions at p4, p5, p6, and p7 selectively reduced the recognition via HLA-DQ8trans (Fig. 5B). In contrast, clone L3-12 did not discriminate between HLA-DQ8 and HLA8trans, and recognition via both HLA-DQ molecules was abrogated by substitutions at p2, p3, p5, and p8 (Fig. 5C). Comparable results were obtained with clone T15 and the γ-gliadin peptide (Fig. 5D). Together, these results showed that for the four T cell clones tested, alanine substitutions impairing recognition via HLA-DQ8 also impaired the recognition via HLA-DQ8trans, indicating that the overall conformation of the peptide in HLA-DQ8 and HLA-DQ8trans is likely to be very similar. We performed molecular simulation to understand how the peptides tested bind HLA-DQ8 and HLA-DQ8trans. The α-gliadin (DQ8–glia-α1), γ-gliadin (DQ2–glia-γ1), HMW-glutenin (DQ8–glut-1), and DERAA peptides were modeled in HLA-DQ8 and HLA-DQ8trans (Fig. 6). Although the simulation was based on the crystal structure of the HLA-DQ8–insulin B11-23 peptide (26), the structure obtained for the α-gliadin peptide in HLA-DQ8 (Fig. 6A) also fit the previously reported crystal structure of this HLA-DQ–peptide complex (15). The side views of the peptides indicated that the overall conformations of the modeled peptides bound to HLA-DQ8 and HLA-DQ8trans were very similar (Fig. 6). However, significant shifts in the orientation of some of the amino acid side chains were observed. For example, the Y at relative position 3 in the HMW-glutenin peptide (Fig. 6C) and the F at relative position 5 in the γ-gliadin peptide (Fig. 6B) were oriented differently in HLA-DQ8 compared with HLA-DQ8trans. These molecular simulations provided a potential explanation for the differential binding of the glutenin peptide to HLA-DQ8trans versus HLA-DQ8: p1Q and p9Q were better accommodated in HLA-DQ8trans than in HLA-DQ8, and residue p3Y was present in a shelf in HLA-DQ8trans (30, 31), whereas no equivalent structural arrangement existed in HLA-DQ8 (Fig. 7). Likewise, the selective binding of the DERAA peptide to HLA-DQ8 may be explained by the fact that p1L and p9D were better accommodated in HLA-DQ8 compared with HLA-DQ8trans. Moreover, the four acidic residues in the antigenic peptide, from p−2 to p4, rendered overall binding of DERAA to HLA-DQ8 more favorable, because of the several positive surface charges on the surface of the latter (23). Taken together, these in silico molecular simulations were in line with the in vitro peptide-binding and T cell-recognition experiments. 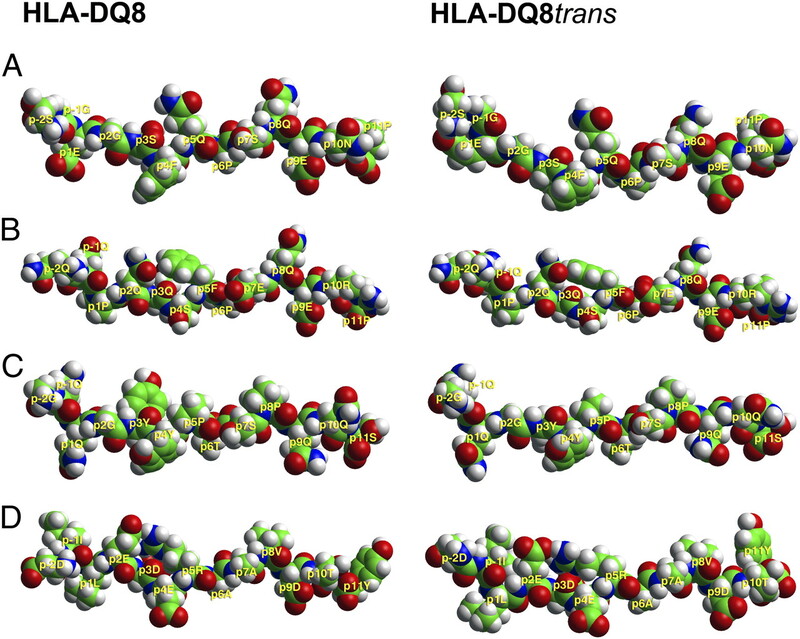 Molecular simulation of HLA-DQ8 and HLA-DQ8trans complexes. Side view (at the level of the β-sheet floor from the side of the β1 domain of each respective HLA-DQ molecule) of the bound peptide, with the residues in space-filling format, after molecular simulation of the respective structures. Atomic color code: carbon, green; oxygen, red; nitrogen, blue; hydrogen, white. For clarity, the HLA-DQ molecules are not shown. A, DQ8–glia-α1. B, DQ2–glia-γ1. C, DQ8-glut-1. D, DERAA. In the two cases for which there was no detectable binding within the EC50 limit of 100 μM (C for DQ8 and D for DQ8trans), the simulations depict the short-lasting complexes of peptide and HLA-DQ molecule. Molecular simulation of the HMW-glutenin peptide in HLA-DQ8 and HLA-DQ8trans. Top view of the α1β1 domain of HLA-DQ8 (A) and HLA-DQ8trans (B) with bound DQ8–glut-1 peptide, with the HLA-DQ molecules in surface mode colored according to atomic charge (blue, positive; red, negative; gray, neutral). Select residues in potential contact with the TCR or antigenic peptide are shown as transparent sticks with transparent molecular surfaces. Antigenic peptide residues are in space-filling form. Figure obtained after molecular simulation of the respective structures. Atomic color code: carbon, green (except for transparent residues that are in orange); oxygen, red; nitrogen, blue; hydrogen, white. The p3 “shelf” of DQ8trans is apparent by the covering of p3Y by α58F. Our experiments revealed that HLA-DQ8trans can serve as a restriction element for gluten-specific T cells and that most of such T cells display extensive cross-reactivity between HLA-DQ8 and HLA-DQ8trans. The reactivity of T cell clones to the same peptides presented via either HLA-DQ8 or HLA-DQ8trans suggests that the TCR interfaces generated by these two types of HLA-DQ/peptide complexes are similar. This idea is supported by the observation that the effects of systematic alanine substitutions in the antigenic peptides on T cell recognition are, to a large extent, comparable for the two types of HLA-DQ molecules. Furthermore, molecular simulation based on the available crystal structures of HLA-DQ8/peptide complexes (15) of four different gluten peptides showed very similar antigenic surfaces of HLA-DQ8 and HLA-DQ8trans molecules. Strikingly, the γ-gliadin–derived peptide that could be presented by both HLA-DQ8 and HLA-DQ8trans was previously identified as an HLA-DQ2 epitope (DQ2–glia-γ1). Yet, the T cell clone specific for this peptide, as well as the α-gliadin (DQ8–glia-α1)–specific T cell clones, responded to their epitopes when presented by HLA-DQ8 and HLA-DQ8trans but not when presented by HLA-DQ2 or HLA-DQ2trans. Therefore, our results pointed to a dominant role for the HLA-DQ8 β-chain (encoded by DQB*0302) in the interaction with the peptide and the TCR, because this is the chain shared between HLA-DQ8 and HLA-DQ8trans and missing from HLA-DQ2 and HLA-DQ2trans. Indeed, although the amino acid differences between HLA-DQ2α (DQA1*0501) and HLA-DQ8α (DQA1*0301) are extensive, they concern the β-pleated base, the inside lining of pocket 9 of the a1 domain, and the region α44-53, none of which is expected to strongly affect interactions with the peptide or the TCR. In a separate study, we compared the peptide repertoires bound to HLA-DQ8trans and HLA-DQ8 and observed that many peptides that bound to HLA-DQ8trans also bound to HLA-DQ8 (M. van Lummel, B.O. Roep, J.W. Drijfhout, P.A. van Veelen, and F. Koning, unpublished observations), similar to the gluten peptides described in this article. Also, recent studies showed that peptides derived from syndecan, thymosin β4, and insulin, all autoantigens in T1D, bind HLA-DQ8 and HLA-DQ8trans (32). Thus, HLA-DQ8 and HLA-DQ8trans may display partially overlapping peptide repertoires in vivo. Despite these similarities, most clones display significantly greater sensitivity when offered peptide in either HLA-DQ8 or HLA-DQ8trans. This may largely be explained by differences in HLA-peptide–binding affinity. For example, the HMW-glutenin peptide bound to HLA-DQ8trans with relatively high affinity but not detectably to HLA-DQ8, and it was recognized significantly better in the context of the former HLA-DQ variant. Conversely, the DERAA peptide showed binding and T cell recognition through HLA-DQ8 only. An analogous phenomenon is likely to apply to HLA-DQ2 and HLA-DQ2trans, because Tollefsen et al. (33) reported that an HLA-DQ2–restricted gluten peptide was preferentially recognized when presented by HLA-DQ2trans. In the current study, we only explored the binding and presentation of gluten peptides by HLA-DQ8 and HLA-DQ8trans. However, it is feasible that the HLA-DQ8 β-chain can pair with other HLA-DQ α-chains as well and that such complexes might also be involved in gluten peptide presentation. This remains to be established in future studies. Previously, we reported that the HLA-DQ2 gene dose has a strong effect on the magnitude of the gluten-specific T cell response: APC homozygous for HLA-DQ2 induced much stronger gluten-specific T cell responses compared with HLA-DQ2–heterozygous APC (24). In the current study, we observed similar effects with some of the HLA-DQ8–restricted T cell clones. For example, T cell clone S13 responded vigorously to stimulation with the α-gliadin peptide presented by APC homozygous for HLA-DQ8, but much more weakly to stimulation with HLA-DQ–heterozygous APC. Thus, analogous to what we observed for gluten-specific HLA-DQ2–restricted T cell clones (24), HLA-DQ8–restricted T cell responses could, therefore, also be dependent on the copy number of the HLA-DQ8 molecules on the cell surface of APC. For the clones derived from HLA-DQ2/8 heterozygotes, it is unclear whether their thymic selection was based on peptides in HLA-DQ8, HLA-DQ8trans, or both. For any given T cell clone, the selecting HLA-DQ molecule(s) need not be identical to the restriction element in the immune response. For example, thymic selection may be based on a peptide bound exclusively to HLA-DQ8trans, whereas Ag recognition during an immune response can be restricted via HLA-DQ8 and HLA-DQ8trans if the antigenic peptide fits both molecules. This could lead to the amplification of unwanted immune responses in CD. In T1D, the combined presence of the HLA-DQ2 α-chain and the HLA-DQ8 β-chain (DQA*0501/DQB*0302, encoding HLA-DQ8trans) constitutes a synergistically increased risk factor (16, 17). Our observation of preferential presentation of the HMW-glutenin peptide by HLA-DQ8trans raises the possibility that peptides derived from islet Ags may exist that are also presented preferentially by HLA-DQ8trans and trigger autoimmune T cell responses that lead to β cell destruction and T1D. In addition, the presence of four different types of HLA-DQ molecules in HLA-DQ2/8 heterozygotes may expand the peptide repertoire presented via HLA-DQ, thereby expanding the HLA-DQ–restricted T cell repertoire, which may increase the risk for HLA-DQ–restricted autoimmune responses. It is likely that in patient S, the HLA-DQ8trans–restricted gluten-specific T cell responses were critical in disease pathogenesis because this patient expresses HLA-DQ8trans, but neither HLA-DQ8 nor HLA-DQ2. However, the role of such responses in HLA-DQ2/8 heterozygotes may be less important because HLA-DQ2 is the main predisposing HLA class II allele (1). In conclusion, we demonstrated that HLA-DQ8trans–dimers are naturally formed on APC of a CD patient and that this patient has gluten-specific T cells that respond to at least three distinct gluten peptides bound to this transdimer. Moreover, we established that a substantial number of T cells can cross-react between HLA-DQ8 and HLA-DQ8trans, whereas others preferentially respond to peptides bound by either HLA-DQ8 or HLA-DQ8trans. Ultimately, these findings may help us to understand the genetic associations of both CD and T1D with HLA-DQ. We thank D. Bontrop-Elferink and R. de Vries for the kind gift of DERAA-specific clones and Dr. A. Zaldumbide for help with the generation of the HLA-DQ transductants. This work was supported by the Celiac Disease Consortium, an Innovative Cluster approved by The Netherlands Genomics Initiative, and funded in part by the Dutch government (Grant BSIK03009) and by the Dutch Diabetes Foundation (Grant 2007.00.038). The Silicon Graphics Fuel instrument and the accompanying software were obtained via a grant from the Epirus Regional Development Programme to the Epirus Institute of Technology, from the 3rd Community Support Framework of the European Union (80% European Union funds, 20% Hellenic state funds). 2005. Celiac disease: caught between a rock and a hard place. Gastroenterology 129: 1294–1301.
. 1994. T cells from the small intestinal mucosa of a DR4, DQ7/DR4, DQ8 celiac disease patient preferentially recognize gliadin when presented by DQ8. Hum. Immunol. 41: 285–291.
. 1989. Evidence for a primary association of celiac disease to a particular HLA-DQ alpha/beta heterodimer. J. Exp. Med. 169: 345–350.
. 2000. The intestinal T cell response to alpha-gliadin in adult celiac disease is focused on a single deamidated glutamine targeted by tissue transglutaminase. J. Exp. Med. 191: 603–612.
. 1993. Gliadin-specific, HLA-DQ(alpha 1*0501,beta 1*0201) restricted T cells isolated from the small intestinal mucosa of celiac disease patients. J. Exp. Med. 178: 187–196.
. 2007. A structural and immunological basis for the role of human leukocyte antigen DQ8 in celiac disease. Immunity 27: 23–34.
. 2004. Genotype effects and epistasis in type 1 diabetes and HLA-DQ trans dimer associations with disease. Genes Immun. 5: 381–388.
. 2007. Relative predispositional effects of HLA class II DRB1-DQB1 haplotypes and genotypes on type 1 diabetes: a meta-analysis. Tissue Antigens 70: 110–127.
. 1988. HLA-DQ molecules form alpha-beta heterodimers of mixed allotype. J. Immunol. 141: 3123–3127.
. 1987. Transcomplementation of HLA genes in IDDM. HLA-DQ alpha- and beta-chains produce hybrid molecules in DR3/4 heterozygotes. Diabetes 36: 114–117.
. 2001. An HLA-DRB1-derived peptide associated with protection against rheumatoid arthritis is naturally processed by human APCs. J. Immunol. 166: 4987–4993.
. 1986. Molecular analysis of HLA class I and class II antigen loss mutants reveals a homozygous deletion of the DR, DQ, and part of the DP region: implications for class II gene order. Hum. Immunol. 16: 205–219.
. 2004. Lentiviral vectors efficiently transduce quiescent mature 3T3-L1 adipocytes. Mol. Ther. 9: 209–217.
. 2008. Large-scale characterization of natural ligands explains the unique gluten-binding properties of HLA-DQ2. J. Immunol. 180: 3268–3278.
. 2000. Structure of celiac disease-associated HLA-DQ8 and non-associated HLA-DQ9 alleles in complex with two disease-specific epitopes. Int. Immunol. 12: 1157–1166.
. 2001. Structure of a human insulin peptide-HLA-DQ8 complex and susceptibility to type 1 diabetes. Nat. Immunol. 2: 501–507.
. 1997. Use of eluted peptide sequence data to identify the binding characteristics of peptides to the insulin-dependent diabetes susceptibility allele HLA-DQ8 (DQ 3.2). Int. Immunol. 9: 905–911.
. 1996. Allele-specific motifs characterize HLA-DQ interactions with a diabetes-associated peptide derived from glutamic acid decarboxylase. J. Immunol. 156: 2171–2177.
. 1999. Glutenin is involved in the gluten-driven mucosal T cell response. Eur. J. Immunol. 29: 3133–3139.
. 1997. Unique peptide binding characteristics of the disease-associated DQ(alpha 1*0501, beta 1*0201) vs the non-disease-associated DQ(alpha 1*0201, beta 1*0202) molecule. Immunogenetics 46: 484–492.
. 1995. The structure of an intermediate in class II MHC maturation: CLIP bound to HLA-DR3. Nature 378: 457–462.